6-piece set of A4-size file folders with all-new illustrations! The set of 6 Touken Ranbu A4-sized file folders designed by Nitroplus is finally here! Features all-new illustrations (6 in total) by our Touken Ranbu -ONLINE- character designers. * Participating illustrators: Shishunki, Jiro Suzuki, Takahiko, Kinako, and Izumi. 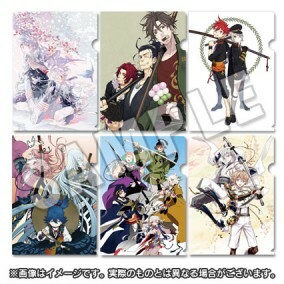 ・Nitroplus Online Store Bonus “IC Card Sticker - featuring print of Konnosuke and the Touken Danshi seal” is no longer available. ・Please contact the distributor Toys Planning directly (info@toypla.com) regarding any product related inquiries. First available at Comic Market 89.